This publication has been made possible through a collaboration between Arp Sanati Dernegi (Association for the Art of the Harp) and Creighton’s Collection as part of our Turkish Music Series. 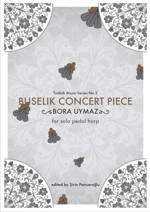 Buselik Concert Piece is inspired formally by the saz semai, an instrumental suite form in Turkish traditional music. Typically the saz semai features a ritornello and verses. There can be up to four or five verses between which the ritornello is to be played. Although the saz semai is always set in the aksak semai rhythmic pattern, this piece is based on the oynak pattern, a 9/8 in which the eight notes are grouped as 3-2-2-2. It also has features that remind us of the fantasy genre because of the melodic embellishments, the rubato feeling present all throughout, as well as the romantic gestures such as arpeggios. Set in the buselik makam, the first verse has two sections in which the first one is a graceful but stately opening, followed by a contrasting run of scales and arpeggios reavealing a sudden mood change. The ritornello which is called teslim in Turkish music is a sweet and graceful combination of leaps and runs emphasizing the tonic A. The second verse picks up on the stately opening with a lot of energy moving forward with downward arpeggios, chords, modulations and but then calms down into a naive series of sequences ending on the dominant chord. 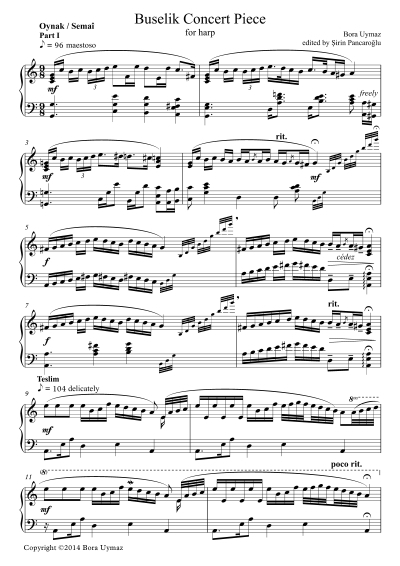 The third verse is somewhat dark in mood and begins with a plaintif figure in the lower middle range of the harp, switching back and forth between various moods without finalizing on any of them. Some modulations take the verse into a dramatic point which gets resolved with the naive teslim heard for the third time now. The last verse is in 3/8, something typical in saz semai form, with a dance-like feel to it. Here scales and arpeggios build into a momentum, but then again a very naive melodic section comes in with new material. To end, the teslim is heard one last time.